In some wind tunnels, the measuring devices are located external to the model and the test section. In other tunnels, the measuring devices are placed inside the model. The location of the device affects the choice of mounting system for the model and the data reduction necessary to determine the aerodynamic forces. On this web page we will examine the external balance. 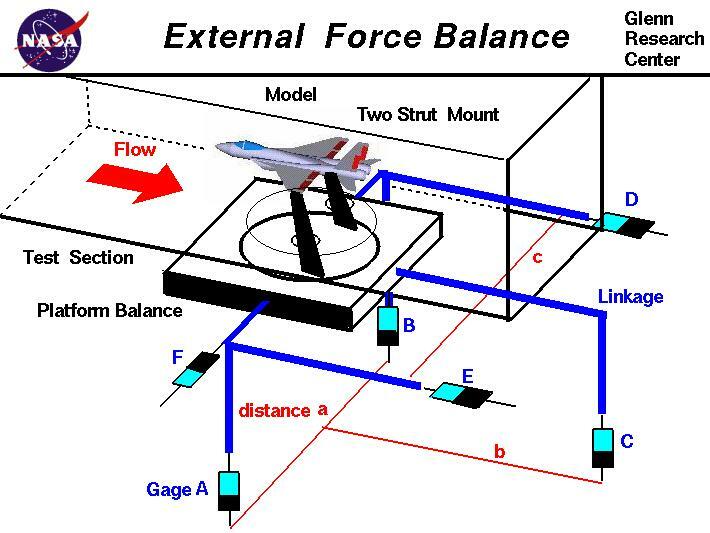 As shown in the figure, an idealized fighter plane model is attached to a platform located beneath the test section by a two strut mount. There are six strain gages, labeled A through F, that are connected to the platform. Each gage measures a force by the stretching of an electrical element in the gage. The stretching changes the resistance of the element which changes the measured current through the element according to Ohm's law. The model can be rotated in pitch and roll by its connections to the struts, and rotated in yaw by the circular section in the floor of the test section. A test is conducted in the following manner. With the tunnel turned off and no air passing through the test section, the weight (W) of the model and mounting system is determined as the sum of the forces from gages A, B, and C. The tunnel is then turned on and air flows over the model. The model generates aerodynamic forces and moments that changes the readings on the strain gages. Notice that the gages are aligned with or perpendicular to the walls of the wind tunnel. The reduction of the data from the gages gives forces and moments that are aligned with the wind tunnel walls. An assumption is made that the flow in the tunnel is perfectly aligned with the walls.